While classics will stay in style forever, I find a lot of clients are looking to spruce up their homes in the New Year. Some are looking for a complete addition as they grow their families in 2017 and others just want to love living in their space a little more. No matter the reason, here are some of the top trends we’ll be seeing and doing in home remodeling this year. Functional living spaces are great, but more folks are opting to make their homes a bit more glamorous. This is easily achieved by upgrading finishes, installing top of the line appliances, and really focusing on the details like chandeliers and hardware. Vanity conversions will also be popular this year, with homeowners choosing to add statement pieces to their master bathrooms. Comfortable does not have to mean quaint. You spend so much time in your laundry room- you might as well love it. Adding built-in cabinets and countertops maximizes space and keeps the room tidy. We also like to add a pop of color on one wall to keep the space from feeling too utilitarian. Natural materials continue to be in demand in kitchens and bathrooms. In 2016, you saw a lot of marble and gold combinations, as well as wood and metal mixtures that really added an earthiness and approachability to design. Expect to see this trend continue, especially with more rose gold and muted silver added to the mix. Pantone has named its color of the year and it’s a bright one. Greenery is a lively and deep green with a bit of yellow to it. Any realtor would tell you not to go overboard with this hue, but I think it would be a great accent to an outdoor living space or bathroom. Move over black and white. Rich navy blue and creamy beige are trending as 2017’s neutral colors. Both blend well with the wood and marble that homeowners love lately and add a calm sophistication to any room, especially open living spaces. 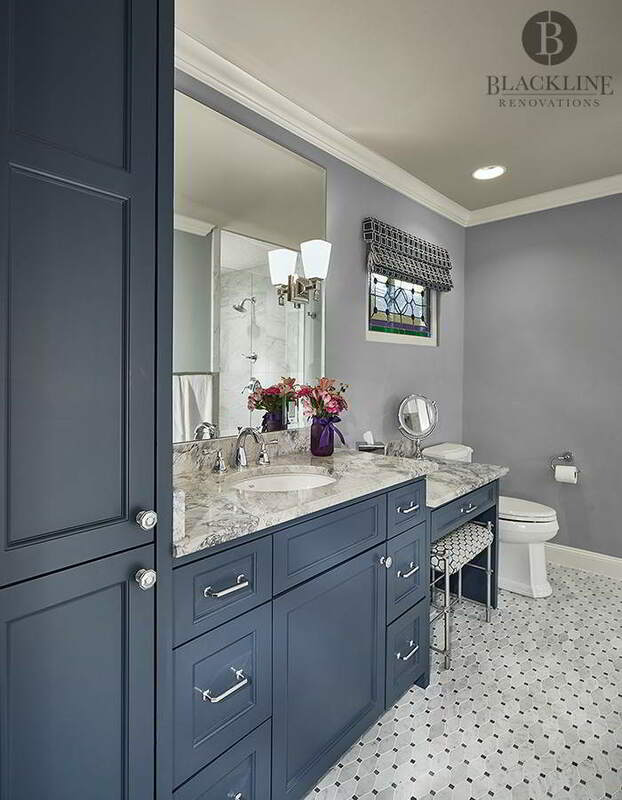 Blue and gray were the traditional bedroom colors, prized for their soothing tranquility. That wisdom is turned upside down this year. “According to a recent Houzz survey, intimate or romantic is the third-most desired atmosphere for a master bedroom after calm and cozy. To achieve this mood, colors like raspberry pink, deep ruby red, caramel and even black will be hot in 2017,” (source). Overall, I think there’s a lot to love about the design and renovation trends coming up. At Blackline Renovations, we’ve been infusing fresh styles and ideas into our work since the beginning so we’re excited to tackle your projects in the new year.